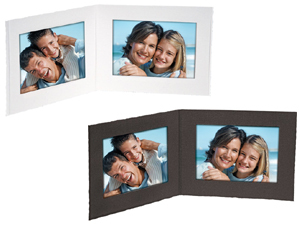 Linen weave finish with deckled edges holds two horizontal 5x7 photos side by side. Optional custom imprinting available. Frame all your photos and prints just like a professional studio photographer. Portrait Folders are suitable for a variety of photographs including: Senior and school portraits, family portraits, engagement and wedding portraits, cruise and resort photography. Photo Opening Size: 6-1/2" x 4-1/2"
In addition to custom imprinting, these folders are also available with theme stamped covers including baseball, golf, graduation and more. See Theme Stamped Photo Folders for details and ordering info.